Move over, Thomas Edison! Nikola Tesla takes the spotlight in a biography of the man who pioneered modern electrical engineering -- and changed the course of history. When a Serbian boy named Nikola Tesla was three, he stroked his cat and was enchanted by the electrical sparks. By the time he was a teenager, he had made a vow: Someday I will turn the power of Niagara Falls into electricity. Here is the story of the ambitious young man who brought life-changing ideas to America, despite the obstructive efforts of his hero-turned-rival, Thomas Edison. From using alternating current to light up the Chicago World's Fair to harnessing Niagara to electrify New York City and beyond, Nikola Tesla was a revolutionary ahead of his time. Remote controls, fluorescent lights, X-rays, speedometers, cell phones, even the radio -- all resulted from Nikola Tesla's inventions. Established biographer Elizabeth Rusch sheds light on this extraordinary figure, while fine artist Oliver Dominguez brings his life and inventions to vivid color. This is a lively introduction to the life of an important figure in technology, someone whose ideas are still at the center of today's world. ... An engaging volume that will encourage both budding scientists and anyone intrigued by the creative process. --Kirkus Reviews [T]his may be the first time readers have met Tesla, and this portrait gives them a solid appreciation for his talents and achievements. --Booklist Stylized illustrations ... show the drama of the man: formally dressed, showcasing his ideas at the Chicago World's Fair; harnessing the hydroelectric power of Niagara Falls with a giant generator; and basking in the lights of Broadway after turning them on. The back matter is particularly strong, including an essay covering Tesla's other ideas and accomplishments; diagrams and notes that explain his scientific processes; a biographical piece about Edison, emphasizing his infamous mean streak; documentation; a bibliography; and a sophisticated recommended reading list. --The Horn Book Rusch combines noteworthy vocabulary with engaging writing to produce a comprehensive yet compelling biography students will enjoy. --Library Media Connection Dominguez's gouache and acrylic illustrations include impressive panoramas of the World's Fair and Niagara Falls... ...[L]ibraries should consider purchasing the book for its clear biographical details reinforced by scientific explanations. --School Library Journal Dominguez's mixed-media paintings ably set the historical scenes for several of Tesla's milestone encounters, and his technical diagrams in the back matter are genuinely helpful. 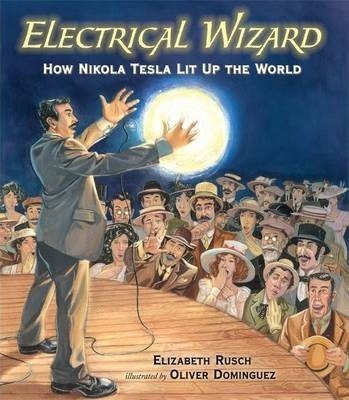 --Bulletin of the Center for Children's Books [A] compelling biography... Told from Tesla's point of view, readers will root for Tesla to win the contract to light up the Chicago World's Fair... The text and back matter, filled with clear scientific notes on electricity, will lead readers to seek out additional information on this fascinating subject. Elizabeth Rusch is an award-winning author of fiction and nonfiction for children, including the picture book biography For the Love of Music: The Remarkable Story of Maria Anna Mozart. She lives in Portland, Oregon. Oliver Dominguez works as a freelance editorial illustrator and is the illustrator of Miracle Mud: Lena Blackburne and the Secret Mud that Changed Baseball by David A. Kelly. He lives in Fort Myers, Florida.